The warm sweetness isn’t just a few bites of pleasure on the tongue. It is a treasured ride to the grocery for one who no longer drives, a reach to the top shelf for Hershey’s cocoa. Nestle’s just won’t do. It is aged hands cracking eggs to separate with the skill of a thousand pies. It is a flour hand print on a left hip while a right hand patiently stirs. It is the wafting scent of melted butter swirling through milk and sugar. A crust browning in the oven. It is knowing the exact moment when things begin to gel. This warm sweetness isn’t just the finish to this family’s supper. It’s 65 years of cool water making perfect meringue, browned peaks curling in delicate circles. It’s cold glasses of milk, hot cups of coffee, and eating a slice in just the right order to make the last bite perfect. Elbows on the table. Dirty plates and near-empty bowls sitting in the early evening light of the window, forgotten to conversation and tastier things. It is love and the plea to sit a while and be. This warm sweetness isn’t just a few bites of pleasure on the tongue. 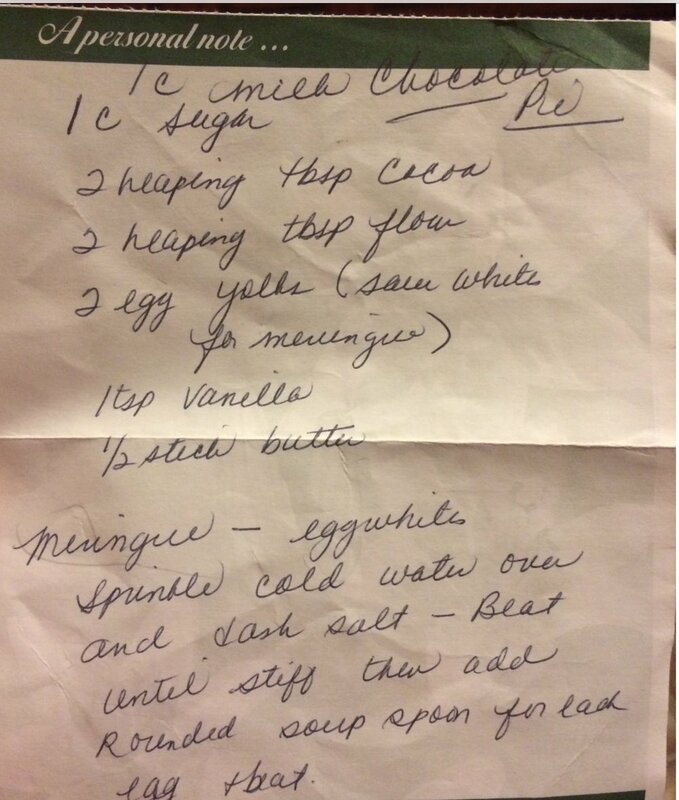 The picture is of my mama’s chocolate pie recipe. Try it. It’s magical. Share it with someone you love.